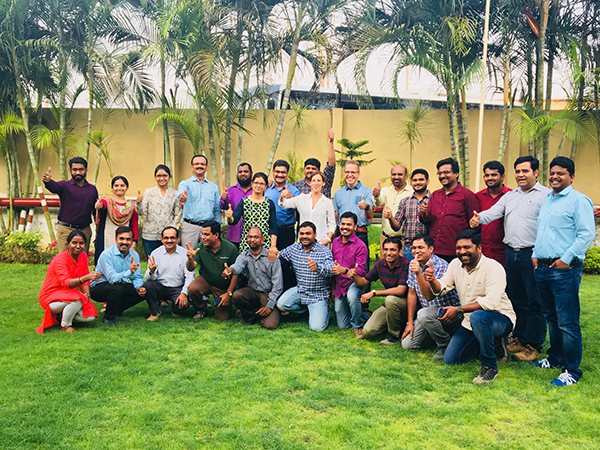 On Thursday, June 28, John van Ruiten (director Naktuinbouw) and Maaike Bruinsma (coordinator NAL / ASLN) presented the NAL certificate (for seed sampling and seed analysis) to representatives of Bayer Seeds Private Ltd. (Hyderabad, India) in a festive setting in Nunhem. Mr. Laxman Dangi (Regional Head Quality Assurance) and mr. Manjunath Nayak (Regional Head Processing) received the certificate. The handover was during a meeting with presentations and speeches, in the presence of Frank Claessens (Managing Director Operations), Marion van de Wal (Global Head Quality Assurance), Bram van Betteray (Regional Head Quality Assurance - EMEA), Erik Selder (Quality Manager Vegetable Seeds) and various representatives from the other Bayer locations (including USA). Very much appreciated was the presence of Gerard Jochems (former NAL manager and QDS at Nunhems). In the nineties he was at the cradle of the NAL authorization for the lab in Nunhem and he was also a participant in the first meeting of the of the NAL Board of Experts.